The heartiness of baked beans, as well as their low costs, makes the side dish a popular potluck item at family gatherings and cookouts. 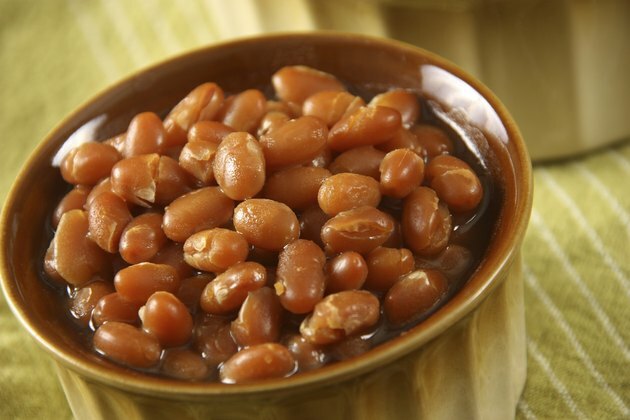 Baked beans are made form navy beans, which are full of fiber, folate, phosphorus and calcium. When you have cooked for a crowd and have leftover baked beans, freeze a batch to save for another day. Allow baked beans to cool to room temperature before freezing. Freezing the beans while hot can cause the containers to expand and potentially break. Place the beans and sauce into a sturdy airtight container. A plastic or ceramic covered dish works better than a plastic bag. Leave a bit of space at the top of the container, called head room, in case the container expands in the freezer. Cover any pieces of pork, if you use meat in your baked beans, with sauce before closing the container. The sauce protects the meat from drying out in the freezer. Write the date on the container. Baked beans can safely stay in the freezer for about six months before the flavor and texture become compromised. When preparing baked beans from scratch, cook them until they are just tender -- think al dente, like for a baked pasta dish. Canned baked beans can become soft and mushy when thawed.